Fairly quick growing cut and come again. 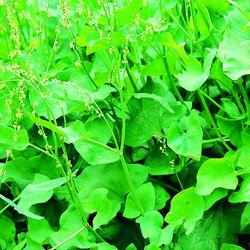 Sorrel has triangle shaped leaves which have a sharp taste of lemon and long stems of tiny yellow flowers. Great to add a bit of citrus to your salads or can be added to egg and fish dishes. Pick young fresh leaves once large enough&comma; cut as much as you like off and it will keep growing back. Regularly cut back to promote new growth.